The big Royal Wedding is only 10 days away and the final touches are being finished up for the wedding the entire planet will be watching. The latest touch? Why the Royal Program of course. 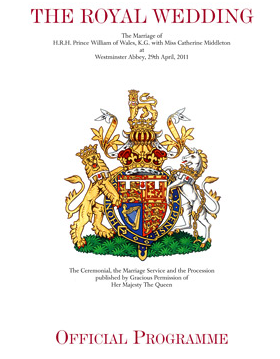 It will include a full Order of Service, a personal thank-you message from Kate and William, and a new photo will be unveiled inside, taken by Mario Testino. The royal army cadets and scouts will be selling the programs along the wedding route and surrounding areas on. The proceeds will benefit the Foundation of Prince William and Prince Harry, which aims to help vulnerable children, fund sustainable development locally and ensure the welfare of veterans and their families.